Commotion in the Ocean: What’s Happening to our Seas? In 2011, underwater temperatures shot up by two degrees Celsius in Western Australian waters — and stayed that way, well above normal, for a staggering 10 weeks. This punishing heatwave changed the ecosystem for good. Returning five years later, scientists found that 100 kilometers of kelp forests had been wiped out — replaced by tropical and subtropical fish, seaweed, and coral. They don’t expect the kelp to return. It’s now clear: Climate change is happening as much below the waves as above. A new study in Nature Communications finds that marine heatwaves have been increasing sharply over the last century. Comparing data from two periods — 1925-1954 and 1987-2016 — the study found heatwaves jumped by 34 percent in frequency. And the duration of heatwaves (number of days per year where underwater temperatures reached high extremes) more than doubled. Finally, the studied showed that intense heating had spread geographically, extending across 65 percent of the ocean’s surface. Less than a hundred years ago, it was common for regions of the sea to go a full year without experiencing a heatwave. Now, the opposite is true: at any particular place, marine heatwaves happen each year more often than not. This isn’t just bad news for kelp forests, but also for many other ecosystems and species, and for people who depend on the oceans for their livelihoods. Perhaps of greatest concern is the world’s coral reefs—bastions of biodiversity, the tropical rainforests of the ocean. Reefs have evolved to survive within certain temperature ranges. But now, the best available evidence—based on massive data-sets and analyses published in the world’s most rigorous scientific journals—suggests we’re blowing right past those thermal limits. When the waters around coral reefs become too warm, the coral expel their symbiotic algae (called “zooxanthellae”), which normally feed the coral via photosynthesis. 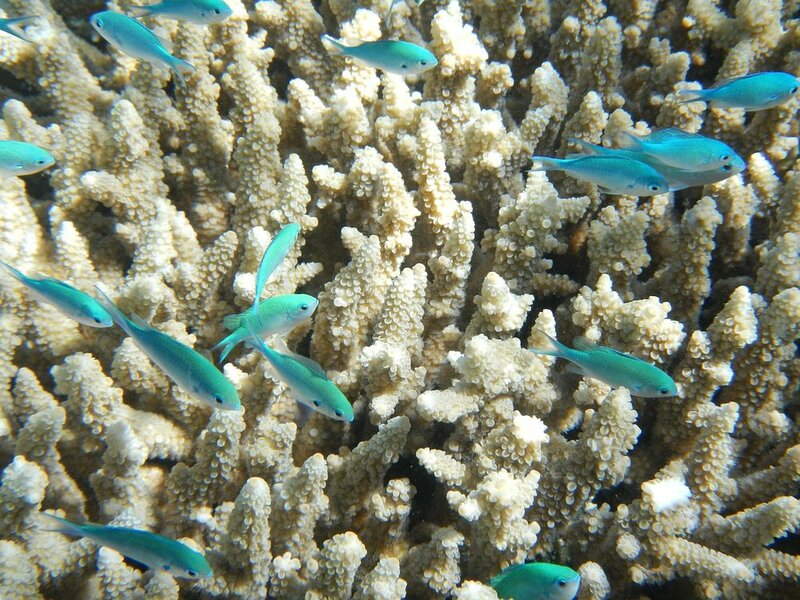 With their algae gone, the coral turns ghostly white—a phenomenon known as “coral bleaching”. If the heat wave lingers over weeks or months, the corals and their algae can’t recover, and the corals and the reefs perish. Hit with a double dose of hot temperatures in 2016 and 2017, Australia’s Great Barrier Reef experienced its worst coral bleaching to date. These heat waves were linked directly to global warming, based on an exhaustive battery of statistical analyses. The upshot: Nearly a third (29 percent) of the Great Barrier Reef has been decimated by overheating in just the past two years. Although the calamity on the iconic Great Barrier Reef was global news, the Australian government is failing to protect its seas at every turn. Australia is, on a per-capita basis, among the very worst carbon polluters in the world—and also sells huge amounts of coal to China, India, and other big-polluting nations. Hence, when it comes to global warming, Australia is part of the problem, not part of the solution. The political conservatives currently running Australia get their marching orders and most of their donations from the country’s massive coal, gas, and mining industries. And if being one of the world’s worst polluters isn’t bad enough, the Australian government has also recommended cutting its marine sanctuaries by half. Indeed, if the current rightwing government has its way, 76 percent of the Coral Sea, home to the Great Barrier Reef, would be opened up to commercial fishing and trawling, practices that are notoriously damaging to marine life. How much more wrong-headed can things be? The next time they go to the voting booth, Australians need to remember the shocking trends and dire warnings revealed by long-term scientific studies of their seas and the global environment. The world is watching, Australia. It’s time to do the right thing. The rainforests of Central Africa’s Congo Basin are disappearing before our eyes. New research is suggesting a major cause is demand for furniture in the United States – furniture manufactured from African timbers that in turn are imported from China. A new study from the University of California examines timber exports from five Central African countries to China between 2001 and 2015. During that period, China more than doubled its wood imports from the Congo Basin, the world’s second-largest rainforest, and is now its biggest timber importer. Trevon Fuller, lead author of the study, has little doubt that U.S. markets are a main driver behind increased pressure on African forests. U.S. consumers have long loved low-cost Chinese flooring, furniture and plywood. Further, satellite data from Fuller’s team shows that forest loss in Congo Basin nations rose when timber exports increased. While the U.S. is clearly part of the problem in Africa, China is at least as much of a worry. For example, in 2013, the European Union introduced the E.U. Timber Regulation. It requires ‘due diligence’ from importers to verify that timber being brought into E.U. markets isn’t illegally harvested. This slowed timber exports from the Congo Basin to the E.U., but China was quick to jump in and exploit the void instead. And the Chinese worry little about whether timber is illegally harvested or obtained via bribery, according to a wide range of sources. When Gabon banned log exports in 2010 to encourage local wood-processing while stymieing illegal logging, China responded by quickly leaping into nearby Cameroon. Just as bad, Chinese loggers want only round logs (raw timber), providing almost no opportunity for value-adding or local employment (via sawmilling or woodworking) by timber-producing countries. This ensures that China maximizes its profits while local countries stay poor. China is the biggest force behind a growing illegal trade that is stripping the native forests of many countries. Many developed nations – such as the U.S., Australia, and E.U. – are now enacting laws to ban illegal timber imports. But those laws do little to influence China’s aggressive behavior, or taming the dark side of the global timber trade. Ultimately, strong demand from consumer nations for cheap Chinese-manufactured furniture is driving a great deal of deforestation. When the world wants cheap furniture, China will get it for them, one way or another. To celebrate another important milestone for ALERT -- we are now reaching up to 2 million readers each week -- we are going to do something a bit different. Rather than talk about the dire need for nature conservation, we're going to share some images of the last place on Earth where Orangutans, Tigers, Elephants, and Rhinos still coexist -- along with an abundance of other species — the Leuser Ecosystem of Indonesia. We saw amazing things at night. A spotlight reveals the huge eyes of a Slow Loris, a rainforest primate (photo (c) Siprayudi). To learn more about the Leuser Ecosystem or help to save it, contact the Sumatran Orangutan Conservation Programme or Forest, Nature and Environment of Aceh. As part of our investigations, ALERT researchers have discovered an astonishing new mode of human communication — called "Twitter". Twitter is amazing, because it allows ALERT scientists to track hundreds of environmental issues and then tweet you the most urgent ones. Will China and Indonesia kill off the world’s rarest ape? Only in an upside-down country like Australia would the term “Liberal” actually mean far-right conservative. Australia’s "Liberal Party" showed its true colors last week by toppling the country's conservative but mainstream Prime Minister — in an effort to install their own right-wing hero. A hero that nobody liked. Thankfully, the attempt failed, miserably. And in advancing this ill-fated coup, Australia’s hard-core conservatives haven't just failed themselves. They’ve failed and embarrassed all Australians. And the Earth as well. For right-wingers in Australia, there seems to be only One True God: The god of mining and fossil-fuels — especially coal, the dirtiest of all energy sources, which Australia burns and exports massively. The god of mining generously feeds and rewards Australia’s right-wingers – with a heady diet of tens of millions of dollars each year – mostly from foreign-owned corporations. In turn, the right-wingers fall all over themselves telling Australians that coal is good — and how efforts to slow global warming and promote renewable energy are ill-considered and economically bad. But no matter what else might happen, the far-right conservatives have been looking to help themselves. The latest political disaster — resulting in Australia’s seventh Prime Minister in just the past decade — shows just how bad things Down Under have become. And Australia can thank its far-right extremists. For the growing comparisons of Australia to unstable, tin-pot dictatorships. For the election of Australia to the annals of environmental shame. It almost sounds like Trump’s America. Australians have never hesitated to wag their fingers at the environmental sinners of the world. Don’t destroy Indonesia’s rainforests. Stop the illegal logging of New Guinea. Stop global warming before it kills off our Great Barrier Reef. But those arguments are ringing hollow now. Just a decade ago, things seemed different. In 2007, Australia named global-warming Icon Tim Flannery as Australian of the Year. It seemed to herald a view that Australians saw the environment — and their role in protecting it — as a major priority. But since then, good will has flown out the window, along with an unnervingly long list of national leaders. The conservatives killed off Australia’s carbon-pricing scheme – making Australia the first developed nation ever to do so. In Queensland, rapid broad-scale land clearing has roared back. The iconic Great Barrier Reef is being battered by extreme heat-waves and by pollution from rapid land-clearing and runoff. Heat-waves and droughts recently caused the largest dieoff of mangrove forests ever documented in Australia. And Australia’s higher-altitude species — specialized for cool, cloudy conditions — are increasingly taking it in the neck as the thermometer rises. The list of eco-calamities keeps growing. And the politicians from Australia's hard right — and their all-powerful mining god — can be thanked for much of it. With their clumsy, bully-boy tactics, the Australian far-right is not just hurting the country's environment and its booming outdoor-based tourism, lifestyles, and industries. It's ravaging Australia’s credibility as an international leader — as a nation with enviable principles and conscience. It surely isn’t worth it. In the land Down Under, it’s time to stop upside-down thinking and give the right-wingers in the Liberal Party a great big boot into political obscurity. When it comes to climate, things are officially veering out of control. In the towering Swiss Alps, skyrocketing temperatures — above 95 degrees Fahrenheit (35 degrees Celcius) — have revealed a World War II airplane that was buried for over 70 years in a glacier. In England, rare Andean flamingos are laying eggs for the first time in 15 years, because the weather reminds them of their tropical home. In Denmark, a drought is costing farmers nearly a billion dollars. And an intercontinental heatwave is killing people across the Northern Hemisphere as it provokes devastating wildfires in Greece and California. It seems like global heat records are being broken year after year. And a new study in Nature Communications suggests we won’t see any relief soon. Using a novel statistical approach, the authors of the new study predict that the next five years — beginning this year — will be even warmer than expected. In any one year, global temperatures are a consequence of two interacting factors, both of which are accounted for in the new study. One of these is the escalating buildup of greenhouse gases, caused by over 30 billion tons of carbon dioxide and other heat-trapping gases that humans spew into the atmosphere each year. The other is natural climate variation, which results from a range of different factors, including occasional volcanic eruptions and cyclic variations in global sea temperatures that operate over multi-year time-periods. The best-known of the oceanic cycles is the El Niño-Southern Oscillation, but there are others, such as the Indian Ocean Dipole. “Global warming is not a smooth monotonous process,” the researchers write in the new paper. Importantly, the authors looked at temperatures only on a global scale. They did not attempt to predict which regions will experience heat waves or extreme temperatures. But there’s no question the double-dose of warming will hit wildlife and biodiversity hard. Animals and plants don’t have air conditioning. Climate change has already impacted innumerable species, from pikas to sea turtles, from Mexico’s lizards to Australia’s white lemuroid possum. Whole ecosystems, including coral reefs, mangroves, cloud forests, and of course the Arctic and Antarctic are being pummeled. While the prediction for the next 5 years is anything but good, it may provide a political opportunity to convince leaders and the public of the urgency of combating global warming. Perhaps unsurprisingly, humans are more easily convinced of the reality of global warming when it happens to be hot outside. And there’s plenty of things we can do to combat global warming. We can move far more actively towards green energy, while divesting from fossil-fuel companies and other heavy polluters. We can pull out all the stops to protect and regenerate forests, peatlands, mangroves and other carbon-rich environments. And we can decisively address the fundamental causes of environmental pressures, especially human population growth. Yes, over the next 5 years, it’s almost certainly going to get warmer. But we are not helpless. It doesn’t have to be hot forever. Jeremy Hance, a leading environmental reporter, is an occasional contributor to ALERT. In a worldwide press release, researchers from ALERT and Indonesia today strongly criticized an Indonesian corporation — for using “deplorable” tactics to promote a project that would imperil the world’s rarest species of great ape. The corporation, North Sumatera Hydro Energy (NSHE), is “pressuring and cajoling scientists, throwing money around to buy influence, making false statements, and now has hired a public relations firm specializing in corporate crisis management,” said ALERT director Bill Laurance. Only 800 individuals of the Tapanuli Orangutan — the rarest great ape on Earth — survive today, in a small tract of rainforest in northern Sumatra, Indonesia. NSHE is planning a hydro-energy project that would cut across the ape’s habitat, reducing and fragmenting it, and thereby greatly increasing its vulnerability to illegal poaching, fires, deforestation, mining, and logging. The hydro project — to be funded with more than $1.6 billion from Chinese lenders — is provoking wide and escalating criticism. Concerns about the project have been spurred by recent articles in The Conversation, The Christian Science Monitor, National Geographic Online, and Mongabay, among others. The advocacy group Avaaz has rapidly collected over 1.2 million signatures from those opposed to the project. And today, the largest environmental group in Indonesia, WALHI, lodged a lawsuit against the North Sumatra government for approving the hydro scheme. In evident panic, NSHE has hired a public relations firm that specializes in corporate crisis management. Using intense tactics, the PR firm is attempting to sway leading scientists — including those from ALERT — who hand-delivered a letter to Indonesian President Joko Widodo last month in opposition to the project. “The PR firm is repeating falsehoods from the dam company and attempting to confuse the public,” said Onrizal Onrizal, a forestry scientist at the University of North Sumatra. What the hydro corporation fears most, ALERT believes, is that key funders, especially the Bank of China, will withdraw their support for the project. Notably, the World Bank’s International Finance Corporation and the Asian Development Bank have refused to support the hydro project — largely on environmental grounds. This is because the project would cut through some of the biologically richest rainforests on Earth, imperiling the Tapanuli Orangutan and many other threatened species, including the critically endangered Sumatran Tiger. But Chinese financiers and Sinohydro, China’s national hydroelectric authority, have strongly backed the project to date. China is the major driving force behind the Belt & Road Initiative, a global labyrinth of some 7,000 infrastructure and extractive-industry projects that will span much of the planet. These projects will slice into many of the world’s remaining wild ecosystems, potentially opening them up like a flayed fish. The hydro project in North Sumatra is part of the Belt & Road scheme. Chinese President Xi Jinping claims the Belt & Road will be “sustainable”, “circular,” and “low-carbon”, but the hydro project is turning into an acid test of those gentle words. Right now, the Belt & Road is looking more like a global environmental crisis than anything else. The recent collapse of several massive Belt & Road projects in Malaysia is a signal that the scheme has intense dangers and vulnerabilities. Scientists have been adamant in their conclusions about the hydro project in North Sumatra: it is an environmental disaster in the making, and should never have been approved in the first place. But despite growing national and international condemnation, NSHE continues to push for the project — pulling out all the stops in a desperate bid to save it. In any other nation, and with any other financiers, it is difficult to imagine a project like this advancing. But in Indonesia, with abundant Chinese money behind the scenes, who can tell? It just demonstrates that when big money is involved, some corporations will go to virtually any lengths to get what they want — even with the world’s top environmental experts uniformly telling them it is a terrible idea. NSHE should be careful — it could end up with a globally toxic reputation — losing business, influence, assets, and market share. Prospective financiers such as the Bank of China should run away from this hydro-nightmare and from NSHE — or they will be equally guilty of ringing a death knell for one of our closest living relatives. All images courtesy of the Sumatran Orangutan Conservation Programme. Could Feminism Save the Earth? Feminism is all about human rights and equality, right? It’s not about the environment or social conflict or economic and political stability. Feminism has far more wide-ranging effects than most of us realize. It influences our society and economy like rainfall affects flowers. Like oxygen affects our survival. And that’s crucial because we are living on a planet that is veering out of control in terms of its population growth, consumption of Earth’s finite resources, and environmental impacts. According to the United Nations, Africa’s population could quadruple by 2100. South Asia and parts of the Middle East are also on rapid population-growth trajectories, as are many other developing nations. We could have 10 or 11 billion people by the of this century and still have more coming, because the global population has not yet stabilized. Feminism means different things to different people and cultures, but it’s unified by a view that women deserve equal opportunities for education, employment, financial benefits, and human rights. Globally, we’re a heck of long way from achieving gender equality, and the disparities vary a lot among cultures and societies. In broad terms, Africa, the Middle East, and Central Asia rank lowest in gender equality, Western Europe is the highest, and other regions are in between. Many folks don't realize just how crucial the empowerment of women and girls is for the world. The most urgent goal is "Let Girls Learn" — allow girls and young women an opportunity to gain an education. In demographic terms, this consistently raises the age at which women have their first child — because instead of bearing children they’re studying and commencing a career first. For instance, in a developing nation, an uneducated girl might have her first child in her teens, whereas a young woman who had some educational and career opportunities might wait until her early 20s. And that one change is magical — it makes all the difference in the world. Population growth slows dramatically because women who start their families later almost always have fewer children. At the same time, the generation time (the interval between birth and reproduction) increases. Let’s imagine two Earths, each of which have 1 billion people. On Unstable Earth, girls begin their families at age 16 and have 6 children each. After one century, how many people would that Earth have? About 73 billion — an incredible increase. But on Stable Earth, girls begin their families later, at age 23, and have just 3 children each. After one century, how many people would it have? Half a billion. About 150 times less. We can make this ultra-simple example more realistic by including the fact that, in smaller families, a larger fraction of the children will survive — as they’ll be better-off financially, with better food and health care. If we assume child survival increases from 70 percent in large families to 90 percent in smaller families, then Unstable Earth will have 8.6 billion people after a century, whereas Stable Earth will have one-third of a billion people — still about 25 times less. Amazing. The point is to demonstrate the incredibly powerful effect of allowing girls and young women to get an education. It’s a complete world-changer. Doing so slams the brakes on runaway population growth. And it works fast — we start seeing the benefits almost immediately. Fertility rates can potentially drop very rapidly, bringing almost immediate benefits where population pressures are high. But Wait — There’s More! Why Aren’t We Doing More? Given the astonishing and immediate benefits of educating young women, why aren’t we pushing this harder? Why aren’t Western Europeans investing every spare penny in Africa and the Middle East — to reduce the social conflicts, wars, and intense immigration pressures Europe is having to endure each year? Why wait until there are four times as many Africans as today? And why aren’t North Americans doing the same thing for rapidly growing countries in Latin America and the Caribbean? And Australians for burgeoning nations in the Asia-Pacific? Bottom line: We should all be pushing hard to promote education and equality of young women because it’s the right thing to do. And just as importantly — for our societies, economies, environment, and planetary stress — it’s the smart thing to do. Want to increase your environmental I.Q.? From the Amazon to Elephants, ALERT produces super-quick videos on some of the world’s most pressing environmental issues. Each video last from just seconds to 3 minutes. They’re in English below (and also in Spanish, French, Portuguese, Chinese, Indonesian, Malaysia, and Papua New Guinea Pidgin). And some are formatted for mobile phones. They’re great for becoming an instant expert, and terrific for students. Please watch them — and Like and Share them too! Why chop the Amazon in half? In a letter hand-delivered today, 25 world-leading scientists from ALERT urged Indonesian President Joko Widodo to halt a hydro-power project in northern Sumatra that would imperil the rarest great ape in the world. The 25 scientists hail from the Pacific region, North and South America, Europe, and Asia, including Indonesia and China. Their letter can downloaded here (English version, Indonesian version) along with a press release (English version, Indonesian version). “The Tapanuli orangutan was described by scientists only last year, and they were shocked to realize there were only 800 of the apes remaining alive,” said Dr Onrizal Onrizal, a forestry researcher with the University of Sumatera Utara in North Sumatra, the only Province in Indonesia where the ape still survives. “The most urgent attribute of this species is, when roads appear, it disappears,” said ALERT director Bill Laurance, a professor at James Cook University in Australia. “The biggest threat to the ape is a $1.6 billion hydro-power project," said Laurance. "It is supported by the Bank of China and Sinohydro, China’s hydropower authority — and would be smack in the middle of the ape’s tiny habitat, slicing it in half with new roads, powerlines, and pipelines, and flooding critical habitat too." The scientists say the dam project, know as Batang Toru, was refused support by other major funders such as Asian Development Bank and the World Bank’s International Finance Corporation, which judged the ape’s habitat far too sensitive environmentally to sustain further development. “The power generated by the hydropower project would be very modest,” said Onrizal. “And the Tapanuli orangutan is Critically Endangered, the most dire of all imperiled species. “This is one of our closest living relatives — how could we risk sacrificing it for such a small benefit?” said Onrizal. The ongoing battle over the Tapanuli Orangutan is shaping up as having even greater significance than saving the world's rarest great ape. It is also becoming an acid test for China's $8 trillion Belt & Road Initiative — some 7,000 planned infrastructure and extractive-industry projects that would stretch across half the planet, linking some 70 nations to China via road, rail, and port projects. China has claimed that the Belt & Road would be environmentally sustainable, but leading scientists — including ALERT researchers — have largely dismissed this assertion as being exceedingly unlikely. If China is so driven to push its agenda that it would gravely imperil the world's rarest species of great ape, then how can we believe any of its other assertions about 'green' development?